I DON’T HAVE another embarrassing story to tell today about San Geraldo. (Well, I do, but I’ve decided to give him the day off.) Here’s a photo from the 1920s of my paternal grandmother (center) with a group of friends. I have no idea. NO TENGO OTRA historia vergonzosa que contar hoy sobre San Geraldo. (Bueno, sí, sí, pero he decidido darle el día libre). Aquí hay una foto de la década de 1920 de mi abuela paterna (centro) con un grupo de amigas. No tengo ni idea. It looks like “summer season” has come to an end in Fuengirola. The flags (banderas) are no longer flying along the beach to announce safe surf (green flag), risky (yellow), or dangerous (red). 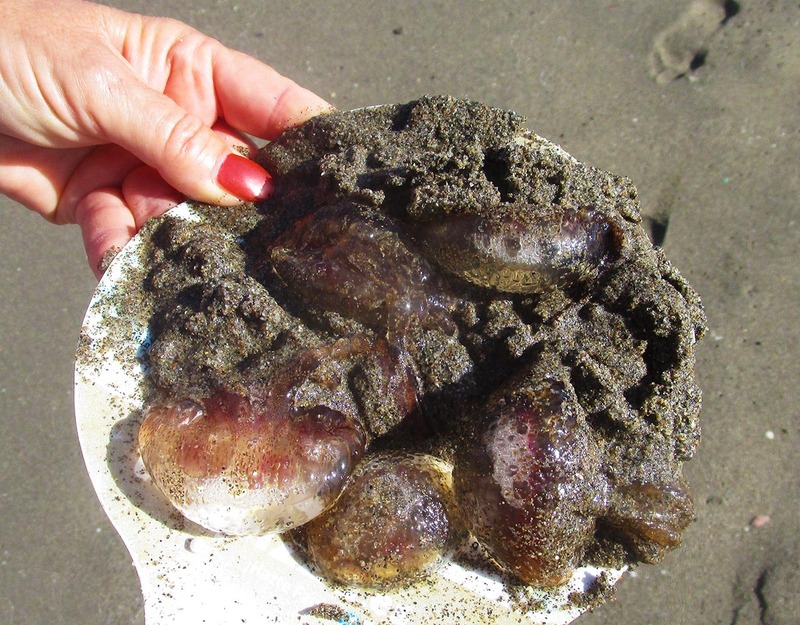 With July being unusually warm and muggy, jellyfish (medusas) were in abundance. So a flag was added to warn swimmers of the risk. 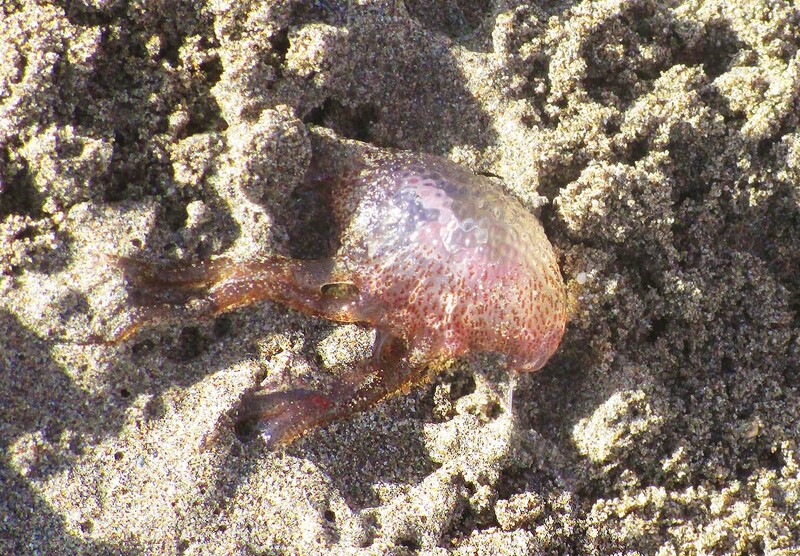 I went for a long walk on the beach yesterday and found myself side-stepping jellyfish most of the way. 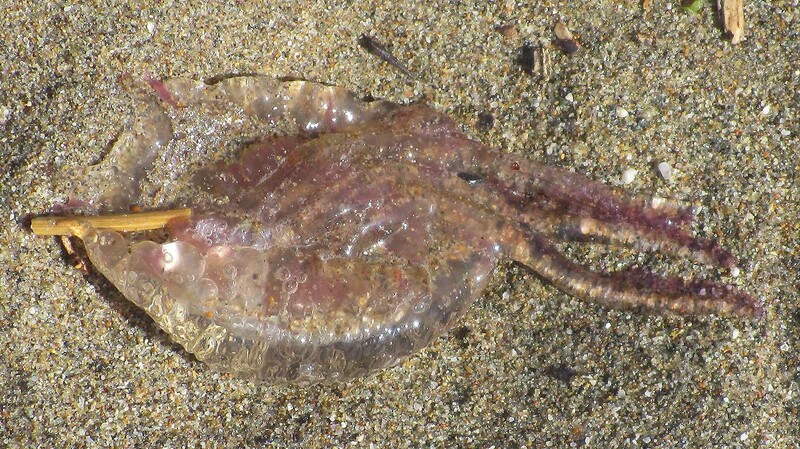 Many beach-goers were collecting them and tossing them in the trash. I jokingly asked the woman with the plate of jellyfish if she was planning to cook them. I was grateful when she laughed and said she really didn’t think so. She then unceremoniously dumped them in the trash bin and went back to collect more. Click the images for a closer look. FROM OUR TERRACE: CAUTION FLAG AND JELLYFISH (MEDUSA) FLAG. I MIRRORED THE IMAGE — THE WIND WAS BLOWING IN THE WRONG DIRECTION! MY FIRST CLOSE ENCOUNTER ON SUNDAY. 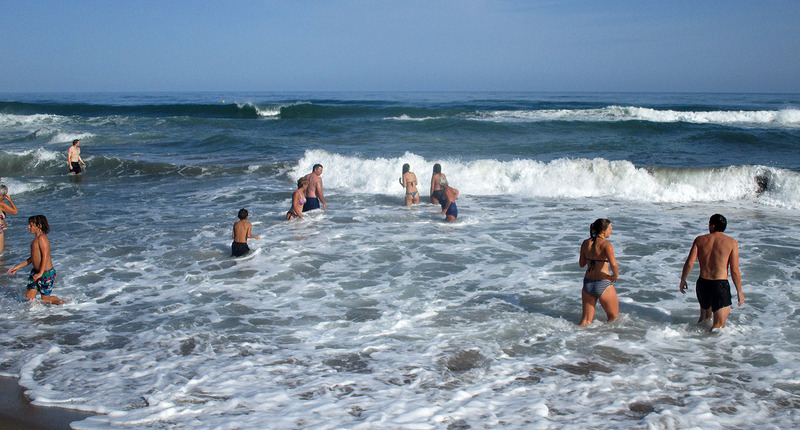 MANY BEACH-GOERS WERE COLLECTING (AND DISPOSING OF) THE THREAT. A YOUNG FATHER WAS PICKING THEM UP SAFELY BY THEIR HEADS. I STILL WOULDN’T RISK IT. AN ODDLY SAFE BIT OF BEACH. Fish fillets are ground with eggs, onion, bread or matzo crumbs, and spices to produce a paste or dough which is then boiled in fish stock. It is popularly (don’t ask me why) served with a fish-broth jelly! To me, it would be like eating jellyfish… Except for the poison. I found the gefilte fish photo at National Geographic (click here). 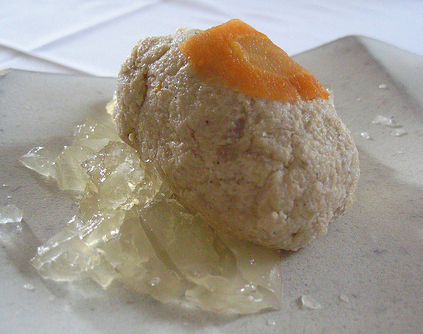 The author of the article, Virginia Hughes, described gefilte fish as a “flaccid culinary specimen” that looks like “brown-gray gelatinous lumps.” I think she was being kind.